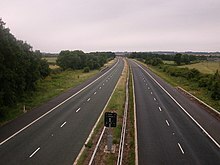 Carillion in constructionTarmac Group was on the A4039 south-east of the city centre in Ettingshall until 2012 when it merged with Lafarge. Marston's is headquartered west of the ring road, on the A41, and have the Park Brewery on the A4124, east of the city centre. The UK's VAT Registration Service, for Value Added Tax is at HMRC in Wolverhampton on the opposite side of the Wolverhampton Ring Road (A4150) to the HQ of Marstons, on the west side of the town centre. Flint Ink UK in the east of the town centre, former Mander Brothers, was the largest ink supplier in the British Empire, before being bought in 1998. BAE Systems Land & Armaments (former Alvis Bridging and Vickers Armstrong) formerly on the A4126 in Ettingshall, near the former Tarmac site, closed at the end of 2011. In Fordhouses, along the A449 to the north, are HS Marston (part of the former Hamilton Sundstrand, now UTC Aerospace Systems) makes heat exchangers, Goodrich Actuation Systems (the former Actuation Division of Lucas Aerospace and H. M. Hobson), and a new engine plant for JLR. Goodrich in the UK, is what became of Lucas before a takeover by Goodrich; Lucas Aerospace was a world leader in flight control actuation for civil aircraft.